This page provides a summary of a PhD Thesis written by Erik Billing. 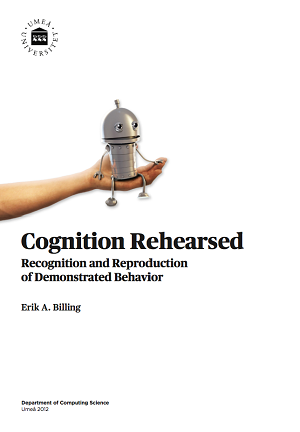 The thesis, titled Cognition Rehearsed - Recognition and Reproduction of Demonstrated Behavior, was defended January 26, 2012. The work presented in this dissertation investigates techniques for Learning from Demonstration (LFD). LFD is a well established approach to robot learning, where a teacher demonstrates a behavior to a robot pupil. The dissertation focuses on LFD where a human teacher demonstrates a behavior by controlling the robot via teleoperation. After demonstration, the robot should be able to reproduce the demonstrated behavior under varying conditions. In particular, the dissertation investigates techniques where previous behavioral knowledge is used as bias for generalization of demonstrations. One way to handle these issues is to introduce a context layer that can support PSL by providing bias for predictions. Parts of the knowledge base that appear to fit the present context are highlighted, while other parts are inhibited. Which context should be active is continually re-evaluated using behavior recognition. This technique takes inspiration from several neurocomputational models that describe parts of the human brain as an hierarchical prediction system. With behavior recognition active, continually selecting the most suitable context for the present situation, the problem of knowledge interference is significantly reduced and the robot can successfully reproduce also more complex behaviors.